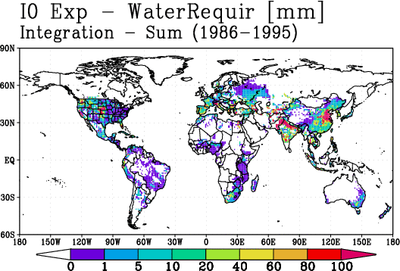 LSS(Land-Surface Scheme) calculate the energy/water/radiation budget of the land surface to provide the lower boundary condition for the atmospheric model. The SiBUC (Simple Biosphere including Urban Canopy) model uses “mosaic” approach to incorporate all kind of land-use into LSS. In the SiBUC model, the surface of each grid area is divided into three landuse categories and five components. 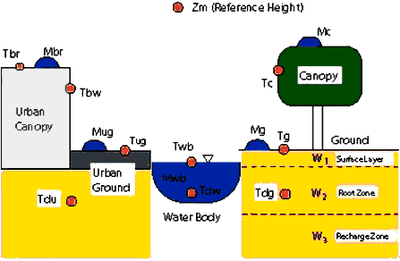 Figure: Schematic image of the land surface scheme (SiBUC). Model structure and prognostic variables are shown. This is a natural land surface area (forest, grassland, bare soil, etc. ), and it is usually treated in most LSS. For the vegetation scheme, SiB is adopted. Some modification from original SiB was done. This is an artificial impermeable surface (buildings, houses, pavement, etc.). A new urban canopy scheme which can account for complex structure of canyon geometry has been developed. Heat island phenomena can be expressed by this scheme. This is a inland water surface (ponds, rivers, lakes) or ocean surface. Diurnal/seasonal variation of water temperature and evaporation is calculated depending on water depth. Owing to the field experiments such as the Lake Biwa Project, GEWEX/GAME Project, paddy field and farmland irrigation/drainage scheme is developed. Which enables us to treat not only the natural water cycle, but also artificial water cycle caused by human activity. Disaster Prevention Research Institute, Water Resources Research Center, Regional Water Environment System Laboratory, S-419D.